The Big Fit play with Jazz Mafia's Heaviest Feather on Friday, July 20, at the HopMonk Tavern, 230 Petaluma Ave., Sebastopol. 8pm. $15. 707.829.7300. WHAT’S IN A NAME? A new band lineup and sound prompted Big Fit’s new name. Changing your band's name is no easy task, especially after more than a decade of popularity. Yet that's exactly what keyboardist and vocalist Spencer Burrows and Sonoma County funk ensemble the Big Fit, formerly known as Frobeck, did earlier this year. Burrows has been a key part of the big band, co-founding it in 2005 with bassist Steve Froberg (now Emily Froberg) and guitarist Kris Dilbeck. Frobeck comes from those two surnames; though Froberg left the group some years ago and Dilbeck decided to step away at the beginning of this year to focus on his own songwriting. "Frobeck is a made-up word," Burrows says. "And this band is not Frobeck anymore. We have a new energy and a new sound, and it needs its own place." With the Big Fit, Burrows and company have expanded on their collaborative songwriting efforts, rather than relying solely on Burrows, and previously Dilbeck, to write the songs. All together, the Big Fit includes guitarist Jackson Allen, vocalist Callie Watts, bassist Ben Burleigh, and three-man horn section Daniel Casares, Alex Scammon and Cayce Carnahan. "Everybody in the band is a heavy hitter," Burrows says. "There are no weak links." Burrows notes that there are a lot of voices now and the group is already finding success in the new songs, which favor a more funk-focused sound over Frobeck's rock-influenced music. "The music is going in its own direction," says Burrows. "It's designed to get people moving, and it's starting to take off." The Big Fit's summer schedule is packed with festivals and other special appearances. They recently played the Peacetown concert series in Sebastopol and camped out at the Mountain Vibe Music Festival in Wilseyville, Calif. In the coming weeks, the band will play at Oakland's Pedalfest on July 28, at local concert series Funky Fridays on the lawn at Hood Mansion in Santa Rosa on Aug. 3, at Windsor on the Green on Aug. 9 and at Napa City Nights on Aug. 17. 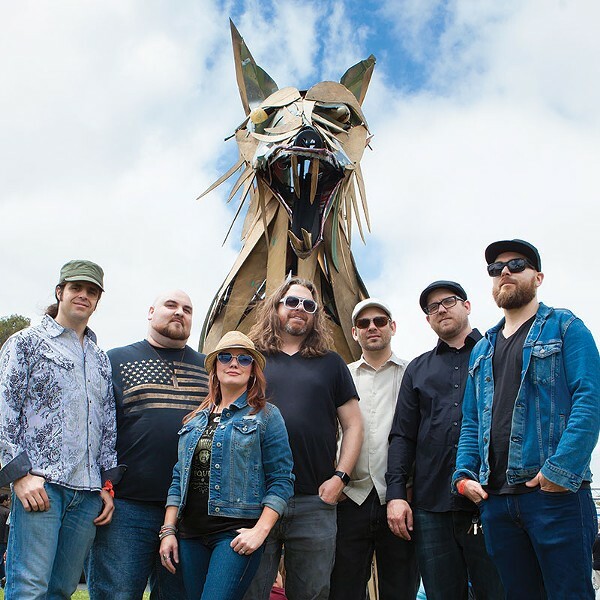 Their summer wraps with a set opening for funk legends George Clinton & Parliament Funkadelic at the Sausalito Art Festival on Saturday, Sept. 1. "We're working toward a completely new set," Burrows says. "Right now, we still rock some of the Frobeck tunes that our fans like, but people are responding super well to the new songs, and we're enjoying it."